Central Reserve Police Force released the recruitment notification R.II-08/16-Rectt (DA.III) for 2945 Constable Posts. The organization invites applications from male and female candidates who are eligible for Constable (Tradesman and Technical) posts. Interested and eligible aspirants can apply for CPRF Constable posts through online at crpfindia.com or crpf.nic.in. The application process is going to start soon on the CRPF Official website. The online Application form will be accessible on the CRPF official website. By filling up the application form, candidates can apply to the Constable Tradesman posts. Candidates willing to apply for CRPF Constable posts can check more details from the following. CRPF (Central Reserve Police Force) annually invites applications from eligible and interested aspirants for Constable Posts. The CRPF has announced 2945 Constable (Tradesman and Technical) posts this year. Aspirants having the suitable eligibility can apply at CRPF official portal during the application dates. Applicants those who are prepared to apply for this employ recruitment of CRPF must have passed the 10th class or 12th or corresponding degree are valid for jobs. Aspirants who are searching jobs after intermediate are applied for these jobs the entitled age limit and age guideline will be available as per the government norms. The selection procedure of these vacancies is based on the skill of the applicants in written test and various other rounds. More details about the CRPF Constable posts are given in the following. Applicants should have finished Matriculation or 10th class, ITI from a standard Board or University. For designation-wise qualification details, aspirants can refer the official notification. For relaxation information, aspirants have to go through the CRPF Official Notification. For all 18 years to 23 years. Age relaxation will be applicable reserved category candidates. Aspirants cleared all the rounds will be shortlisted for the announced posts. selected candidates will get the pay scale of Pay Band-1 of Rs. 21,700/- to Rs. 50,000/- along with Grade Pay Rs. 2,000/- per month. 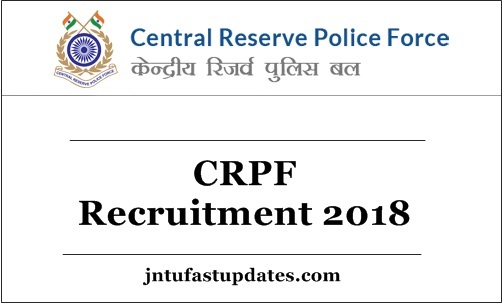 How to apply for CRPF recruitment 2018? Pay the fee through online using any debit/credit cards. Take a printout of the acknowledgment for further reference.